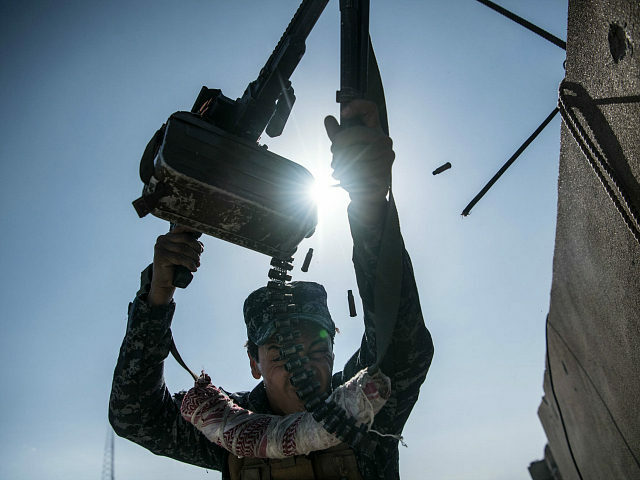 HAWIJA, Iraq (AFP) — Iraqi forces retook one of the Islamic State terror group’s last two enclaves in the country on Thursday, overrunning the longtime insurgent bastion of Hawija after a two-week offensive. Only a stretch of the Euphrates Valley near the border with Syria remains to be retaken from the jihadists who have suffered defeat after defeat in Iraq this year. The operation’s commander, Lieutenant General Abdel Amir Yarallah, had earlier announced that troops, police and paramilitaries had retaken the city center. Hawijah, 230 kilometers (140 miles) north of Baghdad, was at the center of a pocket of mainly Sunni Arab towns that were among the final holdouts from the territory seized by the jihadists in 2014. The town had been an insurgent bastion since soon after the US-led invasion of 2003, earning it the nickname of “Kandahar in Iraq” for the ferocious resistance it put up similar to that in the Taliban militia’s citadel in Afghanistan. The area’s mainly Sunni Arab population is deeply hostile both to the Shiite-led government in Baghdad and to the Kurds who form the historic majority in adjacent areas. Government forces bypassed it in their advance north to second city Mosul last year, which culminated in the jihadists’ defeat in the emblematic bastion in July. Hawija lies between the two main routes north from Baghdad — to Mosul and to the city of Kirkuk and the autonomous Kurdish region — and it recapture is both a symbolic and a strategic victory for the government. “This a victory not only for Iraqis but also for the whole world,” Abadi said, as he announced the town’s recapture after talks in Paris with French President Emmanuel Macron. The UN’s humanitarian affairs office said the number of people still in the town was unknown but could be as high as 78,000. “In addition to the terror they have experienced during years under the control of the IS group, many of the families who are arriving are malnourished,” its acting area manager, Silvia Beccacece, said. Coalition spokesman Ryan Dillon hailed the latest advance on Twitter, saying Iraqi forces were continuing “to crush ISIS in Hawija pocket” and that Abadi’s pledge to “liberate all Iraqi territory and to cleanse it from terrorists” was “close” to being fulfilled. At one point it controlled nearly a third of Iraqi territory. Provincial civil defense chief General Fawzi Yassin said it had taken until Thursday to clear nearly 1,000 mines and booby-traps that the jihadists had planted in and around Anna. The US-led coalition is also backing an Arab-Kurdish alliance, the Syrian Democratic Forces, that is battling to oust IS from its de facto Syrian capital Raqqa. The SDF has captured about 90 percent of Raqqa and is fighting fierce battles with remaining IS jihadists. IS’s other main stronghold in Syria is the eastern province of Deir Ezzor, which borders IS-held territory in Iraq.